Sustainable design…inspired by nature…meadow plantings……edible landscaping…informality. Our gardening goals today are a far cry from the formal design principles espoused by our parents and grandparents. As contemporary gardeners we cheerfully mix flowers among the vegetables, and grow them wherever the light is best… next to the front door if necessary. (Back when I was growing up, the vegetable garden was always tucked discretely away at the farthest point from the house…how inefficient!). Our inspirations flow from the natural landscape, with stands of flowers and grasses flowing casually into one another and moving in the breeze. We enjoy serendipity in our gardens, as with the foxgloves in this picture, which have self-seeded next to the rose. And most of all, we want our gardens to be easy to look after, with designs that can evolve to accommodate our changing lifestyles. No more linear clipped hedges in the new millennium! But when it comes to creating gardens with winter appeal we seem to be stuck in an old groove….formal… symmetrical…somber. When looking at articles about the winter garden I came across a description of an ornate knot garden, all outlined with low growing boxwood hedges, and dusted in a light snow. Pretty, but not for me! And then there were pictures of massive evergreens for ‘winter interest’. I shuddered as I thought about the pruning effort needed to keep them from overwhelming the house….certainly not sustainable! I knew I did not want to design my own garden around making it a winter showpiece. For one reason, our North Country summer is simply too short to weight it down with clipped hedges and doleful evergreens. And furthermore these elements impose a formality in the garden that frankly does not appeal to me. I also know that in New England, as in many other places, we can expect to get a couple of months each winter when the snow will be deep enough to totally obscure details like low growing hedges. How would the knot garden look under two feet of snow? So I decided to take a look at the winter garden with a 21st century point of view and a snow-country mindset….in other words to see the winter garden possibilities through a new lens. Winter is a time to revisit the familiar with fresh eyes. Everything is there, but it all looks so different, and therein lies its appeal. No less than in summer, my winter garden is inspired by our rural New England landscape…which here means a snow-covered winter landscape. Tall trees silhouetted against a clear blue sky. 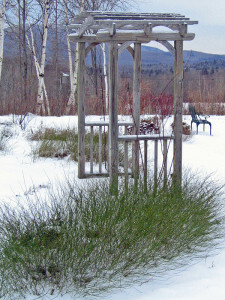 Groups of shrubs contrast with the snowy ground. The shape of a meadow as it transitions to the woods beyond. A distant mountain that feels completely touchable in the dry air of winter. Mesmerizing shadows streaking across the land. Like my summer garden, my winter garden is relaxed and informal. The lines follow the shape of the land, and I have chosen plants that are hardy and easy to maintain. My winter garden also lays out the welcome mat for wildlife, especially birds. 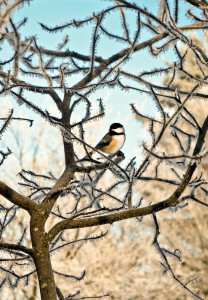 Chickadees, woodpeckers and others are regulars at our bird-feeders. 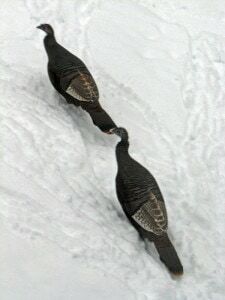 It is always exciting to see unusual visitors, like redpols and cross-bills, that some winters move down from Canada. Turkeys and pine grosbeaks, not to mention the occasional deer, visit the crab apples and winterberries for their winter fruit. In the pages that follow we will look at how to use these ideas to create beauty around our homes even though the flowers are gone.